Opening the nice, padded, metal, protective case the first thing I noticed about this Spinner was the weight - it feels sturdier than those without the aluminum body. I dropped it more times than I care to admit and it definitely took the beating much better than those less hefty models. If you're used to the others it takes a few spins and playing around with hand positioning, but five minutes and you're spinning away. I have to say I am far from a Fidget Pro, but The Helect has an impressive, smooth spin that was noticeable even to a newbie. It also has stainless steel ball and center bearing making it quieter than some competitors. The black/stainless design theme is attractive. It stands out amid all the neon and bright colored spinners. I haven't spun one yet that has all the boxes checked. (Maybe luxury models fill the wish list, but they range 129-199$, so I haven't fidgeted any of those.) 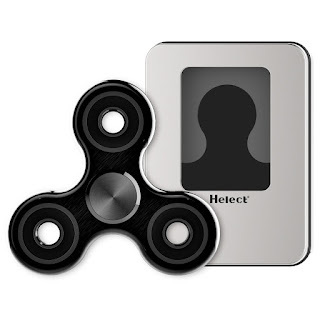 But, you can release some nervous energy, help yourself kick a bad habit, redirect runaway thoughts, be a little less fidgety and have a heck-of-a-lot of fun with this spinner at a very affordable price. The Helect "classic" is the "lil black dress" of Spinners...and you can't go wrong with a classic.